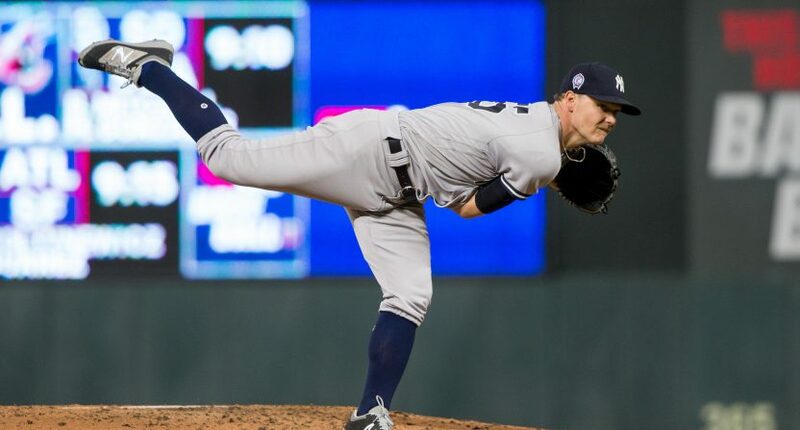 The Yankees are looking to move on from Sonny Gray, and he could be a much cheaper, more reliable upgrade for some teams this offseason. To the shock of, well, no one, the New York Yankees are looking to move on from Sonny Gray this offseason. Gray, who turns 29 in November, will be a free agent after the 2019 season. The Yankees acquired him last July from the Oakland Athletics for a trio of prospects, two of which (James Kaprelian, Jorge Mateo) are in Oakland’s current top ten. The third, Dustin Fowler, was atrocious for Oakland in 69 games this year. But Gray hasn’t exactly been what the Yankees ordered. In 11 starts for New York last season, he pitched to a just fine 3.72 ERA, but his strikeout rate, walk rate, and home run rate all went in the wrong direction from his first half with Oakland. This year, his ERA was a non-just fine 4.90, and while his strikeout and homer rates both improved, his walk rate did not, an Gray was moved to the bullpen for much of the second half of the season. Looking at Gray’s starts with New York, something immediately jumps out at me – the dude just could not pitch in Yankee Stadium. In five 2017 starts in the Bronx, Gray pitched to a 5.65 ERA in 28 2/3 innings. His 29 strikeouts were evened out by 12 walks, and his ERA was destroyed by a whopping eight home runs in those five starts. In his six 2017 road starts after the trade, Gray looked like Gray – in 36 2/3 innings over six starts, Gray’s ERA was 2.21, he struck out 30, walked 15 (still less than ideal! ), and gave up just three homers. Away from the Stadium in 2017, Gray allowed a .279 wOBA. At the stadium, it was .332. Essentially, on the road, hitters hit like Billy Hamilton against Gray, and at home, they hit like Carlos Santana. Those splits carried over into 2018. In 59 1/3 innings at home, Gray pitched to a 6.98 ERA, walking 35, striking out 45, and allowing 11 dingers. In 71 innings on the road, his ERA was just 3.17, his strikeouts soared to 78, his walks fell to 22, and his homers dropped to just three. The wOBA splits were even more extreme – he allowed a .399 wOBA at home and a .274 wOBA on the road. Again, for context, that’s like Billy Hamilton away from the Bronx, and Alex Bregman in New York. Not that you need me to tell you this, but that isn’t ideal. Interestingly enough, those splits never really existed before the trade. In 2017 before being dealt, Gray was actually much better in Oakland’s pitcher-friendly confines, and his road stats were poor. In 2016, Gray was putrid season over 22 starts and stunk at both home and on the road. In 2015, Gray was excellent both at home and on the road. In 2014, he was somewhat better on the road, but not nearly as bad at home as he has been as a Yankee. In a small, 12 appearance sample in his rookie year of 2013, Gray was much better at home than on the road. The larger point about Gray is this – he’s not nearly as bad as his overall stats may indicate. His velocity hasn’t ticked down. He’s a downright good pitcher in road games. He only has one year of control left, and his salary won’t be more than probably about $8 million or so, meaning that he’s not going to cost a team anywhere near what the Yankees gave up to get him 15 months ago. And given the state of the starting pitching free agent market this offseason (we’re looking at Patrick Corbin, maybe Clayton Kershaw, Dallas Keuchel, and uh…a whole bunch of guys you probably wouldn’t want to give more than a year or two), Gray would represent a strong addition for a team that needs to flesh out the middle of their starting rotation this winter. Strangely enough, I think the team that might be the best fit for Gray is…his former team, the Oakland Athletics. The A’s rotation was battered with injuries this season, to the point where zero of their pitchers qualified for the ERA title and just three threw at least 100 innings. Three of Oakland’s top four pitchers by total starts are free agents, and their best starter (Sean Manaea) is a big question mark for 2019 because of shoulder surgery. You mean to tell me Sonny Gray wouldn’t improve the hell out of his former team?